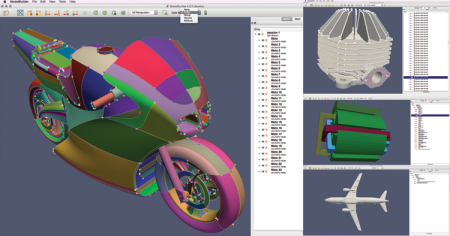 As part of CMB, Kitware created a light-weight library known as Simulation Modeling Toolkit (SMTK). Unlike other open-source libraries, SMTK supports all three core resources, in addition to the inter-relationships that exist between them. SMTK presents an interface for representing geometric models and meshes, the operations that can be performed on the models and meshes, and complex structures. Complex structures are often necessary to model information required by a simulation (e.g., boundary conditions and material definitions). SMTK associates this information with various components of the geometric domain in order to define a complete simulation model. The relationship between SMTK and CMB can be described as follows: SMTK offers necessary functionality via libraries, while CMB provides the application framework. SMTK is written in C++ and includes Python wrappers. The toolkit is distributed under a Berkeley Software Distribution (BSD) license.